Hillary Clinton, always keeping it classy! 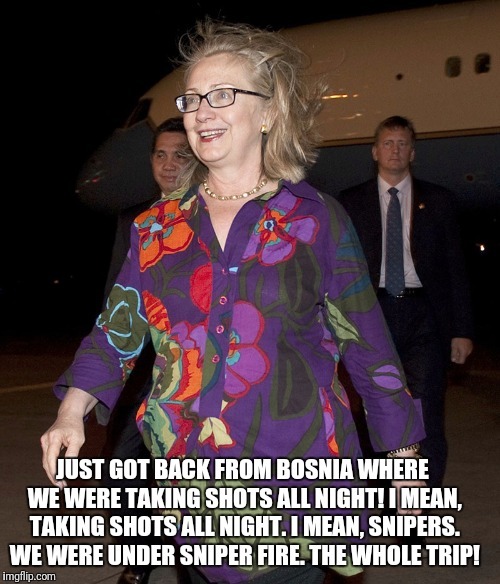 JUST GOT BACK FROM BOSNIA WHERE WE WERE TAKING SHOTS ALL NIGHT! I MEAN, TAKING SHOTS ALL NIGHT. I MEAN, SNIPERS. WE WERE UNDER SNIPER FIRE. THE WHOLE TRIP!